Did you also see that in honor of today, P.F. Chang’s restaurant, one of the first restaurants to have a gluten free menu, has released a new gluten free dessert – Triple Chocolate Mousse Mini Dessert – and they posted some of their gluten free recipes on their website? How cool is that?! But now, back to your regularly scheduled programming…Meal Plan Monday! This week’s Gluten Free Menu Swap theme is beans and is hosted by Heather at Celiac Family. Surprisingly I am not doing too much with beans this week. Unless soybeans as tofu counts? Probably not. But if you’re looking for bean recipes, there are plenty of them around here. Check out Italian White Beans and Polenta, Sweet Potato, Quinoa and Black Bean Burgers or Three Bean Tacos for more bean ideas. 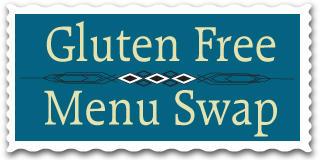 And be sure to check out the other menus at the Gluten Free Menu Swap and over at Org Junkie. As I mentioned in yesterday’s post, we have company coming to town and we are planning on traveling a bit, so I am not planning too much for meals this week. I will have a couple of things on hand to make when and if we want to, but nothing serious is planned. I will also make sure that we have appropriate road-trip food to take with us. What are your favorite road trip foods? Homemade Tamales, of course, with Spanish rice, salad and guacamole. Mattar Paneer and/or Saag Paneer with rice. Grilling stuff – chicken, tofu, potatoes and mixed vegetables. And as for traveling food, we typically take a cooler and bag with cheese, fruit (grapes and apples), crackers, baby carrots, granola/granola bars, KIND bars, M&M’s, trail mix and candied ginger. Sometimes we’ll also take hummus, yogurt and salsa and chips. And if we’re staying at a hotel, I’ll often throw in a bag or two of microwave popcorn and some instant gluten free ‘ramen’ noodles. So that’s it for this week. Hopefully next week I will be back to cooking more and will post a more interesting menu! I never thought of the thai noodles as GF ramen, but I can see it! and thanks for the rundown of your favorite bean recipes. Thanks for joining the GF menu swap this week, and sharing your bean recipes. Have fun on your road trip. Sounds like you already have a good plan for food to take along. If we’re staying at a hotel with a breakfast bar, I will often take along a box of GF cereal and/or oatmeal.